It’s Friday! and time for the Bird Anatomy lesson. As I said last week we’ve hit a patch of easy anatomy terms as we move down the underside of the bird. Today’s body part is the breast. 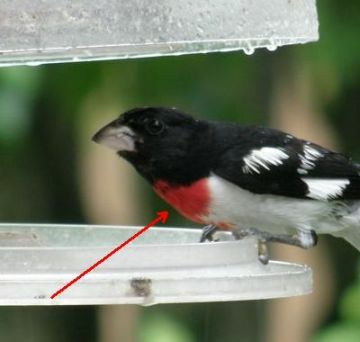 And here’s a rose-breasted grosbeak to illustrate its location. Under those rosy feathers are the breast muscles, the largest, strongest muscles in the bird. They are so large they comprise 15-20% of its body weight. They’re the flight muscles that pull the wings both up and down. In most birds the downstroke is the power stroke, so those muscles are the largest. The upstroke muscles return the wings for the next flap and are ingeniously rigged like pulleys to make the job easier. You can see these structures in a whole chicken breast from the grocery store. Chickens have been selectively bred to produce a tasty bird for humans so what you see on a grocery store bird doesn’t have quite the same proportions as what the peregrine sees when he dines on a pigeon, but you’ll get the idea. Marcy takes such beautiful pictures! Way to go! The supracoracoideous muscle is fascinating!! I can’t make out from cross-section shown in the link, but I assume that its frontal/dorsal penetration is superior (i.e. at, or over, the shoulders) and not inter-thoracic. In any case, I wonder whether there are other examples of such an arrangement: where the opposing muscles of a complementary pair (e.g. biceps/triceps) are both anchored to the one side of the motion.